Click question to see answer. Are there any extra costs once the tour starts? Lunch. We stop at a deli or winery that also has lunch where you can order sandwiches, salads, soups, and other items of this nature. Normally guests will spend less than $10-$16 per person. All of the wineries sell wine by the bottle or glass, and you are more than welcome to purchase some to take home with you. You don’t have to tip your driver, but if he/she does a great job and makes your day enjoyable, a small gratuity is definitely appreciated. Most guests will tip about $10 per person but this is completely up to you. Can we consume alcohol while traveling? Our goal is to deliver fun, informative, and safe tours. Over the years, we have learned that this is best accomplished if alcohol consumption is reserved for your time at the wineries. Therefore, no open alcohol will be allowed on any of the vehicles. There will be plenty of wine at the wineries, we promise! NO OPEN CONTAINERS ALLOWED ON THE VINO COACH OR WINE-O-WAGON. Yes. We have designed the best tours possible based on years of experience and thousands of customers. All of the wineries have been notified of our arrival time and the number of people we are bringing so that they can make special arrangements to accommodate our groups. Is there tasting room etiquette? Please drink responsibly. Those little ounces add up! As you enter the tasting room head to the tasting bar. A host will greet you and get you started with wine glasses and explain what wines are available for tasting. White wines are tasted first, followed by red wines, and then dessert wines. Normally you would not ask for a second taste of one particular wine unless you indicate that you are interested in purchasing the wine. You do not have to drink all the wine in your glass. There is a dump bucket provided for unwanted wine. Sometimes a neutral food, such as crackers, is provided to clear the palate after each wine tasting. Have patience with the wine pourer. If you like a particular wine—purchase it! On many occasions the winery may be the only place the wine is sold. The short answer is no unless your "kid" is over 21. Although children are allowed at the wineries, we have made the decision to keep our tours adult only. Therefore, no one under the age of 21 is allowed on a Fruitful Vine Tour. Do the wineries have tasting fees? All wine tasting fees and souvenir wine glasses are included in the price of the tour. We never cancel the Vino Coach due to rain. The Wine-O-Wagon will also run as scheduled unless there is a dangerous thunderstorm with lightning, in which case we will cancel the tour and refund your full purchase price. Sometimes we deem the weather too dangerous to run a tour and it will be canceled. This happens only about once each winter. You will receive a full refund if we cancel the tour. If you decide not to come even though we are still running the tour, our normal cancellation policy applies. How many people can we have on a tour? All of our tours can accommodate up to 14 people, which is the legal capacity of our vehicles. Under no circumstances can we take more than 14 people on a single vehicle. In addition, most of the wineries prefer groups 14 or less in order to deliver the best service possible. We do have multiple vehicles and on rare occasions will allow two vehicles to travel together in order to keep a larger group together. This can only be done on weekdays and with the special permission of all wineries involved, with Fruitful Vine reserving the final decision. If you want to take a group larger than 14 people, please call us at 269.978.8777 or e-mail us info@fruitfulvinetours.com. Where in Michigan are you? We are located in Southwest Michigan. We are 90 minutes from downtown Chicago, 30 minutes from South Bend, Indiana, one hour from Kalamazoo, and 90 minutes from Grand Rapids. 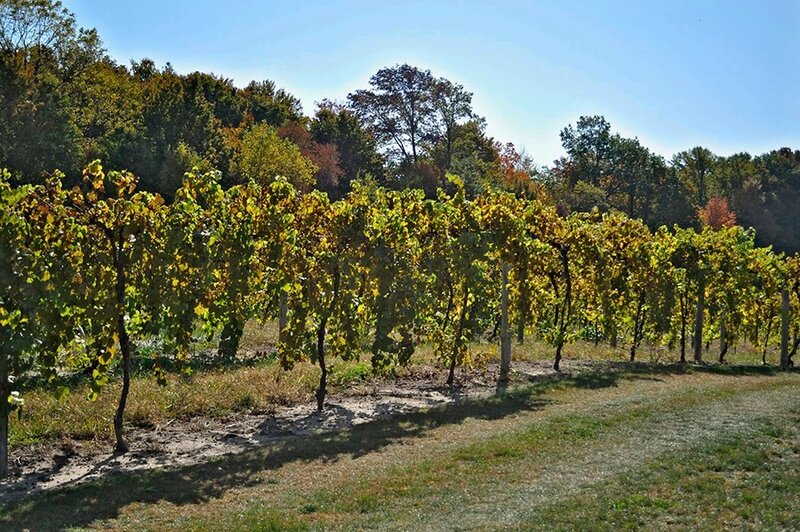 Towns to stay in include New Buffalo, St. Joseph, Benton Harbor, South Haven, and all other beach towns that are part of, or very close to, the Lake Michigan Shore Wine Trail. What if I leave my items on the Vino Coach or Wine-O-Wagon? Fruitful Vine is NOT responsible for any items left on bus. It is guest responsibility to retrieve all items upon departure. This includes purchased wine.